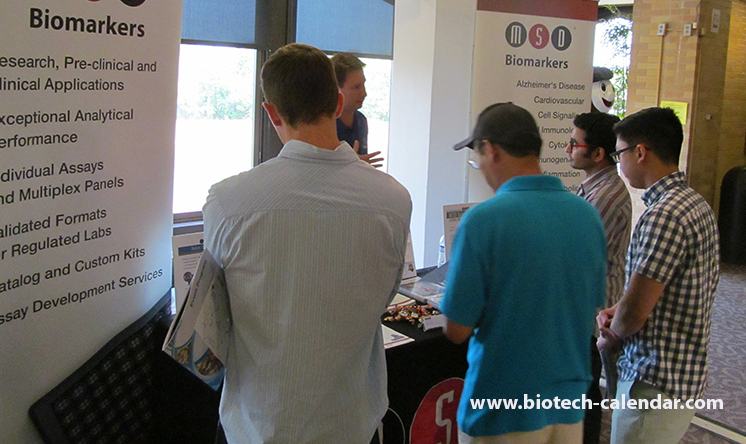 Columbus area researchers discuss new products with Meso Scale Discovery at the 2014 15th Annual BioResearch Product Faire™ Event at Ohio State University. This popular annual event provides PI's, lab managers, post docs, grad students, professors, and all other lab staff with the opportunity to meet face-to-face with numerous different lab supply companies to discover new products available to use in their labs. Express product concerns, ask questions, and get quick responses.Save lab time in the future by meeting with numerous lab suppliers in one place, instead of meeting with them individually in your lab, while you're trying to work. All researchers who attend this free event also have the opportunity to collect a Science Ninja t-shirt or lab coat, win cool door prizes, and enjoy a fully catered breakfast and lunch buffet. View the following video to learn more about the event, and see clips from past BioResearch Product Faire™ Events at Ohio State.